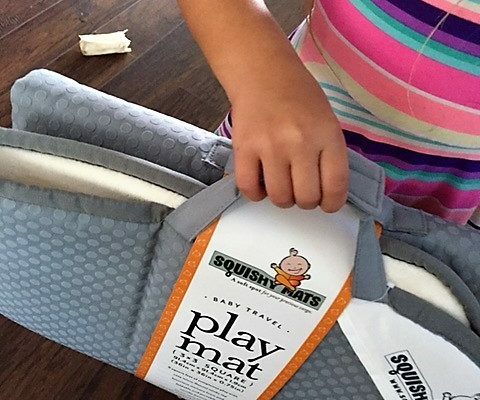 Squishy Mats Review by Elizabeth Hurt | 15% Off All Size Kids Squishy Mats for My Readers- even the 3x3 Size! 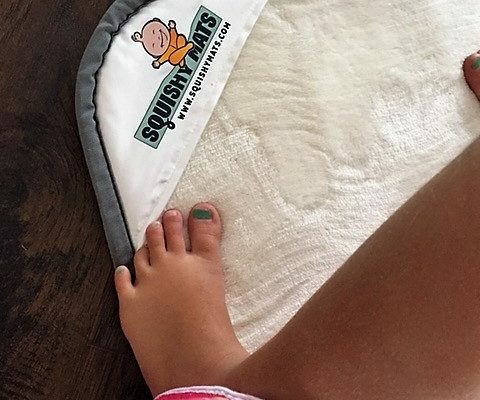 In case you didn’t read our review on the “Skinny Mini” Squishy Mat, you can catch it here. My kids use it every day in their play room to sit on while they play barbies or watch TV. I was thrilled when we were given a complementary 3×3 “Little Squishy” Squishy Mat to review for ya’ll and so was my puppy Buster because this meant he could officially have the “Skinny Mini” in his kennel. 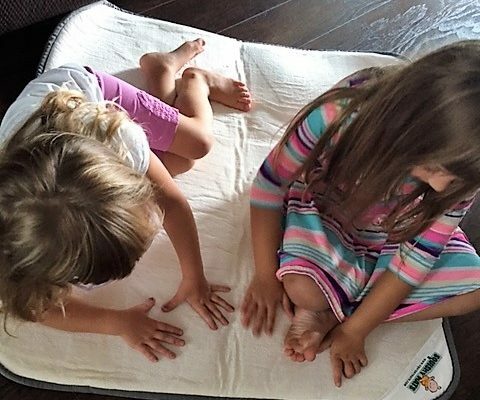 The 3×3 mat is so big and the perfect size for 2 kiddos as you can see. It’s got a 3/4″ memory foam center and non-skid backing so its very comfy for watching TV or changing a baby and you don’t have to worry about it sliding around on the wood floor like I have. The top is soft and minky and has a super cool feature, the built in handle. I love being able to fold it up neatly and throw it in the car to go with us for a trip to grandmas or day at the ball park. Since it folds up so nicely, its easy also to store in the closet or car. The quality of the mats is 10 out of 10 in my opinion for sure, they are going to last. I have even washed mine a couple of times and they look the same as they did when they arrived. The price point , however for the 3×3 is $69.95, which is a bit high I think but the 15% discount code below will help and make it more attractive! Enjoy! Get your Squishy Mat now in 1 of 3 sizes: 3×3, 4×4 or 16×32.